Take my wallet, take my keys, here is my checkbook, can I give you a ride somewhere? I don't know personally if that's true. I'll have someone on my team get back to you. i.imgflip.com/283aj6.jpg (click to show) People are so stupid in what they share .... Like I will be gone for 2 weeks on vacation and my neighbors are all blind and deaf. True, but that’s the point. 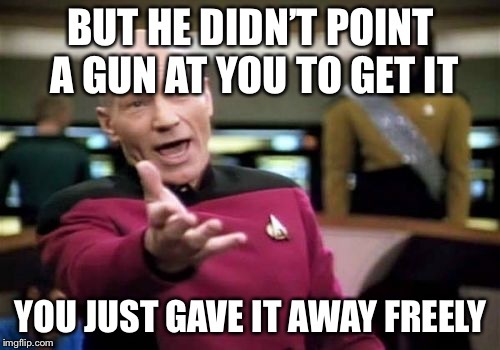 He may not held someone at gun point, but that does not minimize the threat or the impact. A picture of the hamburgler just does not carry the right tone. Point is that instead of waiting for congress to step in (which they won’t) close your Facebook. To be fair, Angry Birds does the exact same thing. Pretty much everything you can download does. 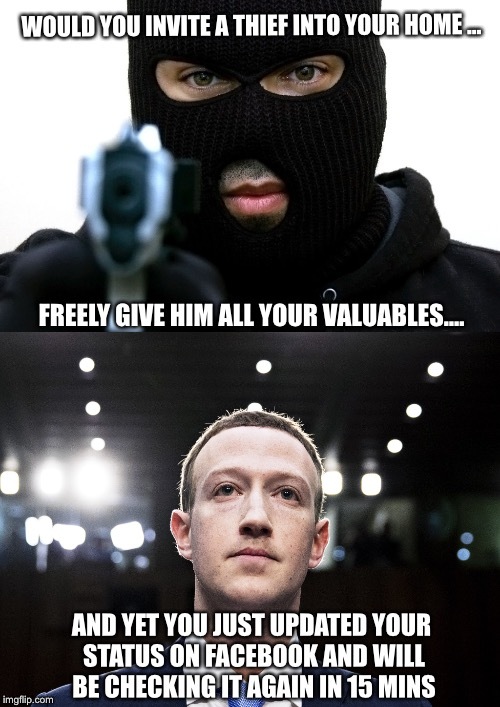 The only reason Zuck got in trouble is because the liberals turned on him when they suspected he took money from conservative alignments and they let the leak info go mainstream via the media. Hacked info happens all the time.